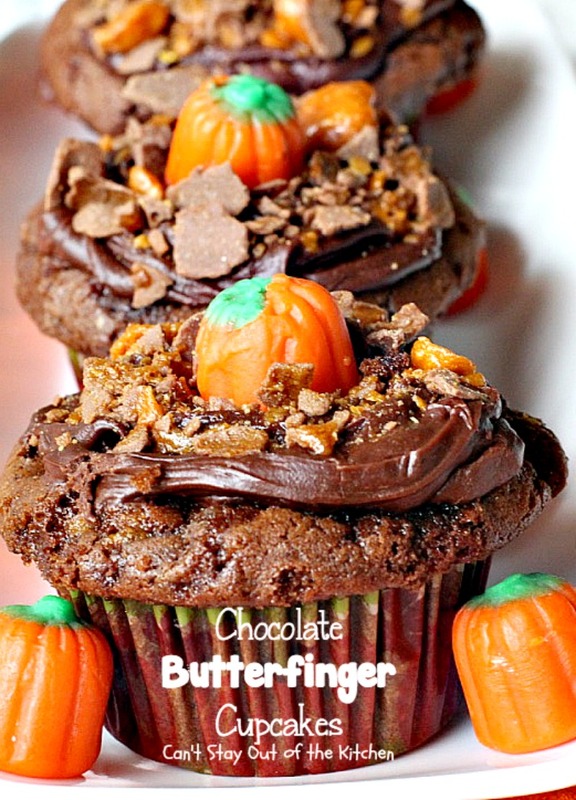 Chocolate Butterfinger Cupcakes are amazing. Well, friends, I have a quick and easy cupcake recipe for you today that’s great for the fall season (Halloween) or the Christmas season (although you can easily make this year round). Especially if you decorate it with candies typical of specific seasons throughout the year. I start with a Swiss Chocolate cake mix and use cream instead of water for richer texture and flavor. Then I added Butterfinger Bits! They’re a new baking product I’ve seen in grocery stores (Wal-Mart) this season. In fact, once I saw them put out before Halloween, I snatched up two packages so I could use them in a recipe. I didn’t know what recipe that would be. I just knew I wanted to try them out! Well, I wasn’t disappointed. After baking the cupcakes I frosted them with a Hershey’s dark chocolate frosting and then sprinkled more Butterfinger Bits on top. They were heavenly–every last bite! The nice thing about this recipe is it’s really quick and easy. You mix a handful of ingredients together and bake them. Spread the cooled cupcakes with pre-made frosting and then sprinkle with Butterfinger Bits on top to give double the Butterfinger flavor. Last month, the daughter of a friend of mine wanted to give out goodies at Halloween. She had a cupcake cookbook with several recipes she wanted to try out. Unfortunately, most of the recipes were a little expensive to make and extremely complicated. I wasn’t up for spending 3-4 hours on each cupcake recipe. 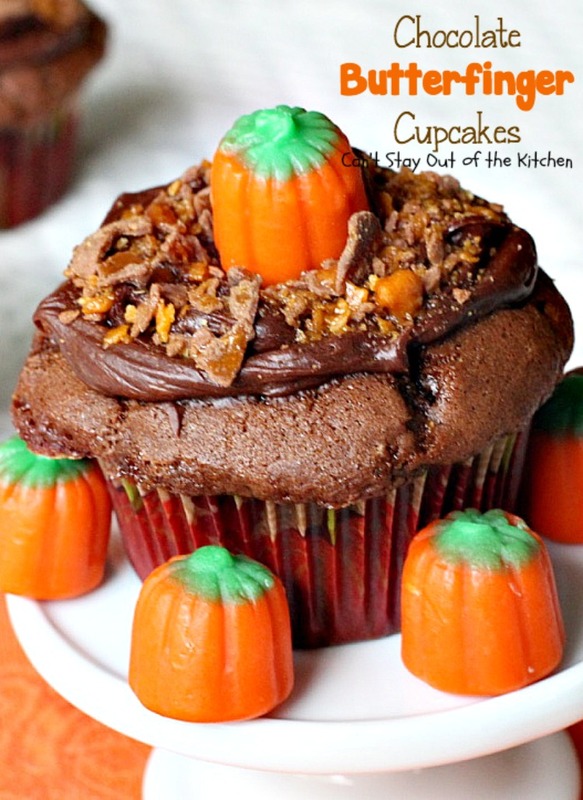 Instead I came up with four easy cupcake recipes, including White Chocolate Funfetti Cupcakes, Candy Corn Cupcakes, Reese’s Candy Cupcakes and this one. All are simple and easy recipes that are perfect for bake sales and school parties. They’re also great for any occasion when you need to whip up a quick dessert and don’t have a lot of time on your hands. Our new neighborhood had a block party for Halloween. So our Sunday night care group got together and purchased several cases of bottled water which we labeled with a note from our church. We passed out cases and cases of cold water to kids and adults who came by, as well as candy (handfuls of candy to each kid! ), and cupcakes. While my little friend and I reserved some cupcakes for our (and their) new neighbors, we still had plenty to give away to others. One of my neighbors told me her son ate both of the ones I had given them so they had to come back for more! Yes, giving out cupcakes was a real treat and these cupcakes rated very highly. 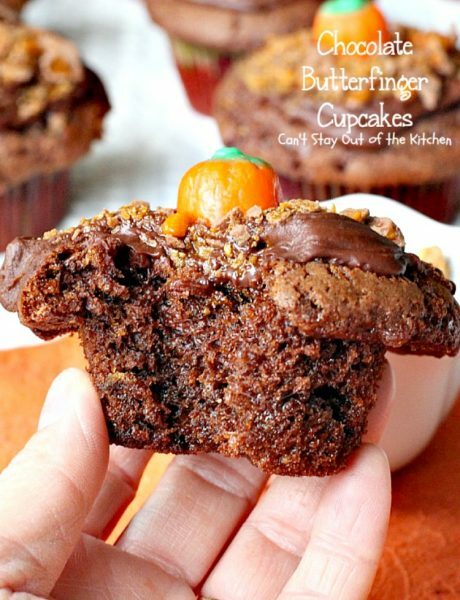 If you’re looking for a great Halloween or Christmas cupcake recipe and you love chocolate and Butterfingers, then this cupcake is for you! It’s also a great cupcake to make for kid’s school parties or any other time you’re sharing food with friends, like tailgating or office parties, baby showers or potluck gatherings. These cupcakes are so soft and fluffy, but I warn you, they’re also addictive! 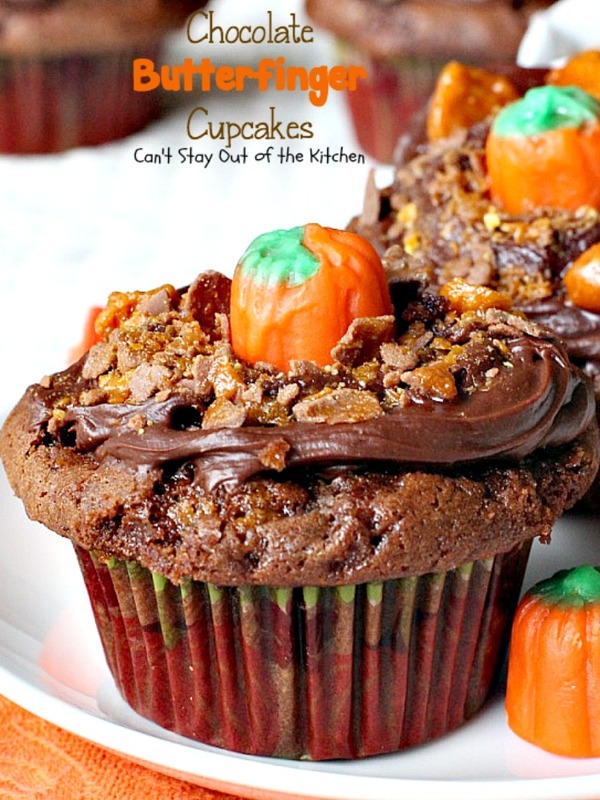 Chocolate Butterfinger Cupcakes are addictive! 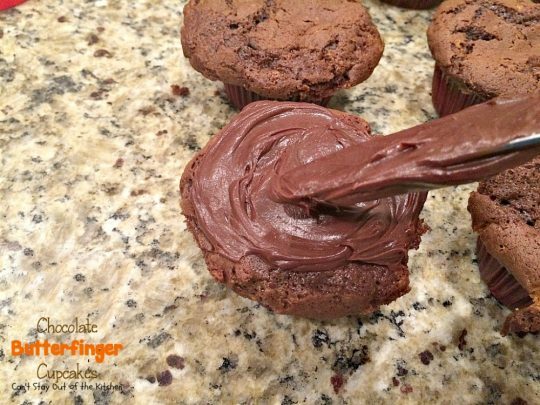 If you enjoy the taste of chocolate and Butterfingers you can’t beat these cupcakes! Every bite will have your mouth watering. 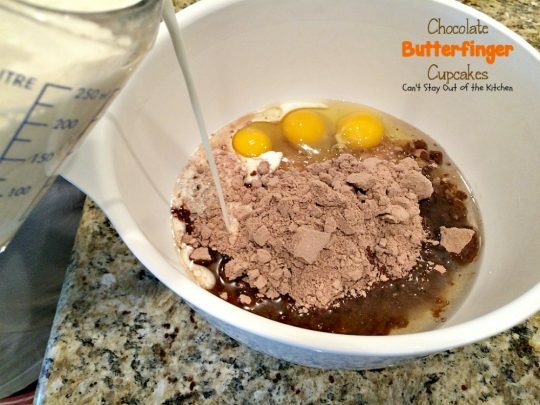 Pour cake mix into a large mixing bowl. Add oil, eggs and cream (half-and-half or heavy whipping cream–even evaporated milk will work). Beat with an electric mixer until smooth. 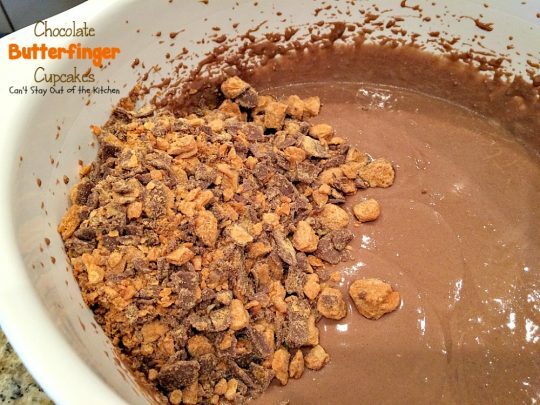 Stir in one package of Butterfinger Baking Bits. Place muffin liners in muffin tins. Spoon cake filling into liners. My little friend was doing this and she got them a little too high. Leave about 1/4 to 1/3 of an inch room at the top – or slightly more than 3/4 full. Bake cupcakes at 350 for about 20-25 minutes or until a toothpick inserted in center comes out clean. Allow cupcakes to cool on wire rack until completely cooled. Spread each one with frosting. 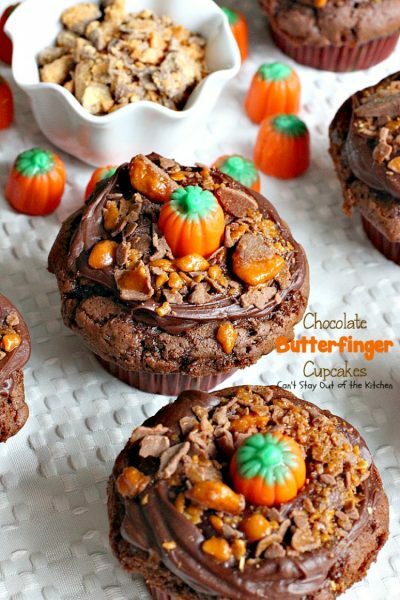 Sprinkle each cupcake with Butterfinger Baking Bits. Then top with your favorite Halloween or Christmas decoration, as desired. 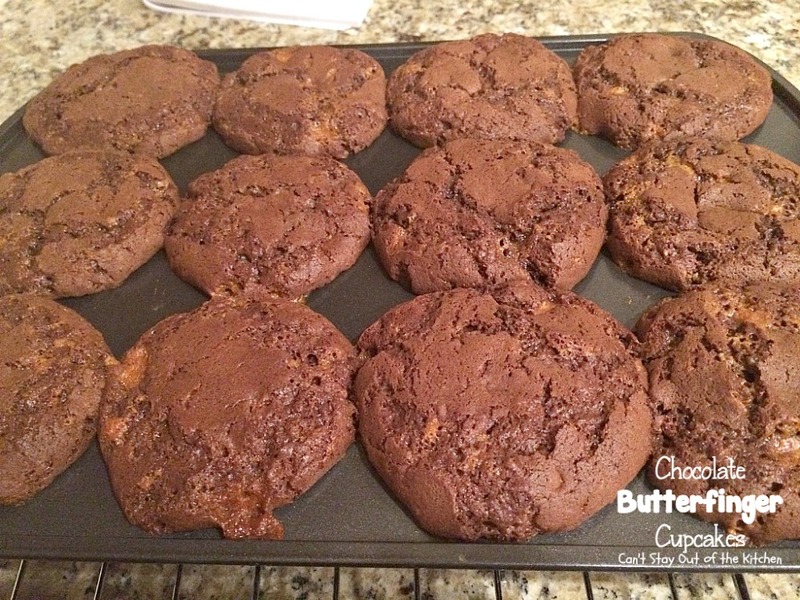 Chocolate Butterfinger Cupcakes are a great holiday treat. 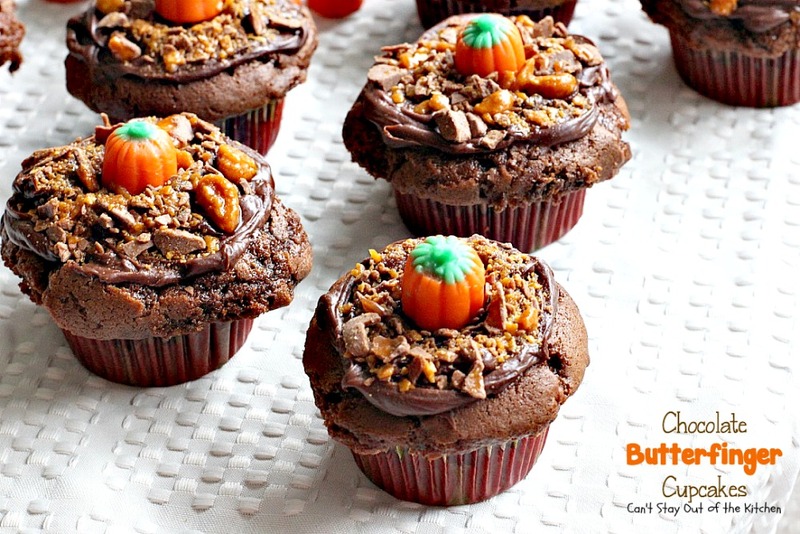 These amazing cupcakes are filled with chocolate and Butterfinger Baking Bits for an incredibly scrumptious Halloween or Christmas treat. Combine cake mix, half-and-half, oil and eggs in a large mixing bowl with an electric mixer until smooth. 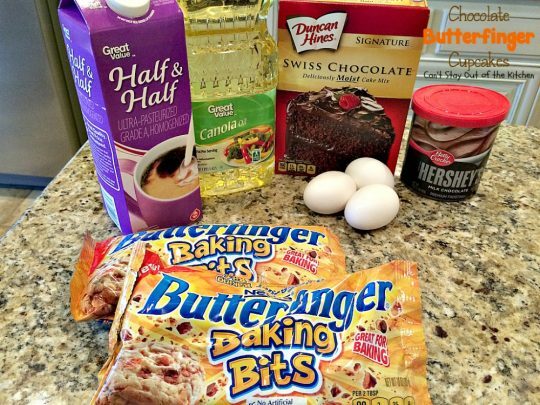 Stir in 1 package Butterfinger Baking Bits. Line approximately 18 muffin tins with paper liners. Pour batter into muffin liners until a little more than ¾ full. Bake at 350° for approximately 20-25 minutes or until a toothpick inserted in center comes out clean. Cool about 10 minutes in pans before removing cupcakes to a baking rack. 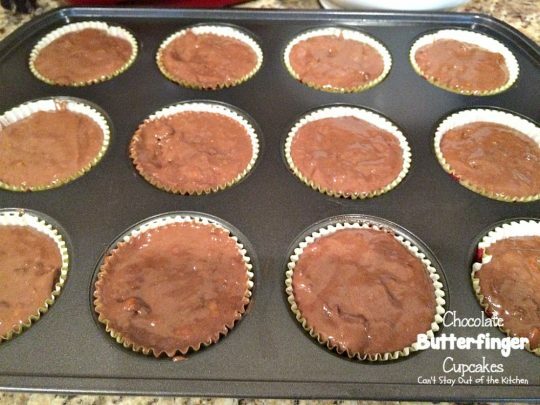 Sprinkle about a tablespoon of Butterfinger Baking Bits on top of each cupcake. 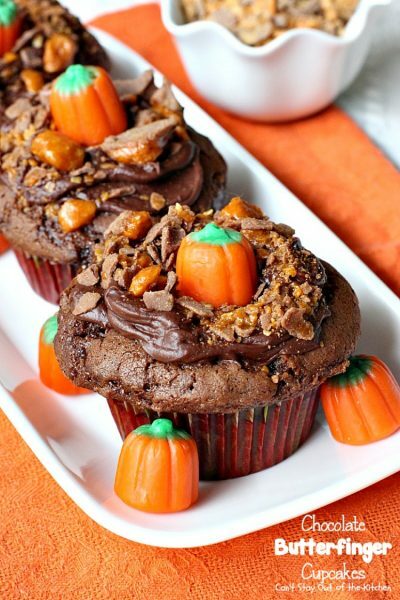 Place a pumpkin candy in the center of each cupcake, if desired. These amazing cupcakes are filled with chocolate and [url href=”http://www.butterfinger.com/ButterfingerBites.aspx” target=”_blank”]Butterfinger[/url]Baking Bits for an incredibly scrumptious Halloween or Christmas treat. Chocolate Butterfinger Cupcakes are great for any kind of party. These are my favorite cupcakes. Can’t wait to make them for this Halloween. Teresa! This is right down my alley! 🙂 Yummy!! !